You are headed to your port to meet up with your floating vacation, your Fun Ship, one of the Carnival Fleet, but do you know what you are headed into? Do you know the terms? Have you studied up a bit before you get on board and do you know how powerful that Sail & Sign Card is? Before most enter the cruise ship, those that have not sailed before, the word Sail & Sign is not a familiar one, but soon you will learn their value. Do you know all of your options with your Sail & Sign Card? Do you know that the Sail and Sign* Card has another name that is used all throughout the ship? The one piece of wardrobe you never want to be without on Carnival is your Sail & Sign* Card(S&S), as it is a lavish little piece of plastic that will make or break your time at sea, so never, ever let it be separated from you! 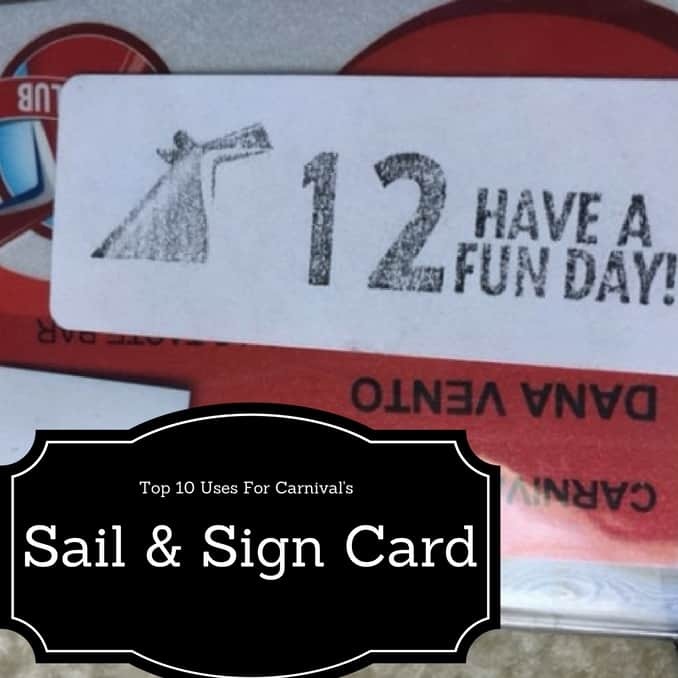 It’s time to lavishly live to cruise out loud with the Top 10 Uses for Your Sail & Sign Card on Carnival. When you are getting ready to board the ship, lots of stuff happens from photos to luggage transfer, and kids wandering off(or so you think!). 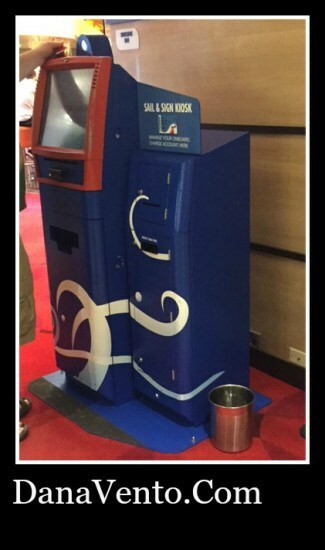 In all the vacation chaos, did you know that the Sail and Sign* card actually is called the S&S and is used EVERYWHERE On the ship, rather than cash? It becomes so easy to make purchases, to buy drinks, charge services at the SPA it just almost makes you forget you are spending money and it definitely keeps the price tags away from your vacation…… but keep your head on you are spending money! When you first get your card issued, your photo is taken, while it is not on the card itself, when it is entered or swiped through the system, your photo appears and whoever is serving you, taking your order, selling you items, or setting you off the ship is looking to see if you match that photo. When you go to get off the ship at the different ports of call, your card is swiped as you leave the Gangway, you have to have it ready. When you get back on the ship, you have the card out again and it is swiped and your identity is once again verified. When you go to make a purchase at the duty-free stores on the ship, your card is swiped and the card charges your account. It is that simple! You can shop, not carry a purse and just sling this card into a lanyard around your neck and you will have everything you need to make your cruise perfect right around your neck. *****TIP******Speaking of lanyards, make sure to bring one along, because you need to have your S&S with you everywhere you go on-board and when you get off the ship. You definitely need to define a great and easy way to carry your S&S with you, and we used lanyards, as did many people. It keeps it hands-free and quite easy. In the Casino, your S&S card in fact, the more you use your card in the Casino, the more free drinks you earn and other great incentives as well. We used our card in the Casino, and while pictures were not allowed, I can tell you it is super easy to start burning through money. I sat down and started at the Penny Slot, and began winning. Pretty much you just program how much you want to have to gamble with, it charges your card, and then you insert your card into the game of choice and play until you run out of money and replenish your funds. It was a fun time of course until I lost. I started out winning, $1.40 at a time, and some lady thought I was a stitch for getting excited over winning pennies, but I felt it was better than losing them. That horse came in and I gradually lost, but all is well, at least I got to play slots! Don’t forget to buy those scratch and win cards, they are super fun! Need a medical supply from the Medical Center? Just stop in and request what you need and it will be placed on your Sail & Sign Card! Need a fresh, dry towel to sit on poolside? Perhaps you are going to hang out on the hot tub or maybe you are going to go to the Dive-In Movie, and want a ‘towel blanket’ for the show, no problem, just use your Sail & Sign Card to check one out. If you towel is wet and need a dry one, just exchange it! Are you just dying to get Spa Topia, that full body relaxing hot stones or bamboo Massage, dry skin body exfoliation, foot and ankle massage, and a refreshing Spa Facial? No Problem, just bring along your Sign & Sail Card, and get pampered! If you are planning an excursion on the next port of call, guess what card you present to place the charges on? If you guessed your Sail & Sign Card you are right as well! Maybe you are headed into the water or through waterfalls and you want to capture all the precious moments, and you can, just rent a GoPro Camera and use your Sail & Sign Card to get you capturing those moments for the day as daily rentals from Carnival Sunshine were available. It’s come down to the last few days of the cruise, the ship photographers have been working hard to capture your moments. You have strutted your stuff, and you got your pictures taken, all dressed up! You can take your pictures home, just visit the gallery of photos(we did nightly) to see what photos had been captured) and then present them to the attendant and provide your Sail & Sign Card and your pictures are not part of your trip! I guess the most important reason to have a S&S Card is not any of the above, but one many of us just take for granted……. Maybe the most important use of all is the ability to get into your room and rest after a full day of fun in the sun and partying! Don’t forget, the Sail & Sign card, let’s you sail and sign but it also lets you into the most sacred space, your cabin! With all joking aside, you can tell how important your S&S Card is to you. Make sure to keep it with you at all times and if you happen to lose it you need to notify Customer Service on the ship right away. Remember, your card is your pass to all the fun on the ship, whether you are getting on and off at ports of call or just in need of a towel at the pool! Lavishly live your Carnival Cruise out loud when you use your Sail & Sign Card! Learn more about cruising and fun adventures in these articles. What a good excursion in Jamaica Togo on and Thank you. I have never been on a cruise before, though I would really love to go. I do love other alternatives to using credit, though, and Sail & Sign cards sound like they fit that bill. This sounds fantastic and I love that it shows a photo too for security! I remember my last visit in a cruise last year, I wish I could visit a cruise again. I like seeing carnival uses. This is so cool, we love to cruise. Have taken many cruises and it is convenient and so much fun. Haven’t done Carnival though will have to try soon. Adriana recently posted..Proud Latina, Orgullosa de Ser Martín! i lived in Fl for many many years and always took spontaneous weekend trips on carnival. Just love them! Nice! How convenient is this card when it comes to shopping or going around the ship. I’d love to try this someday. I have been wanting to go on a cruise for a while now. Carnival sounds like the way to go!